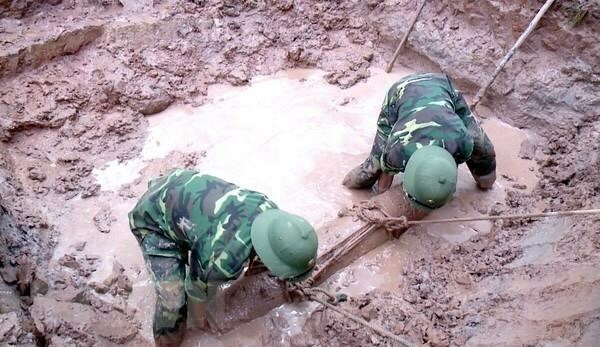 Ca Mau (VNA) – Sappers of the Military High Command of the Mekong Delta province of Ca Mau on April 5 confirmed that they have sent their men to the house of a local to collect a napalm bomb weighing about 75 kg. Nguyen Van Hoang detected the bomb when a bulldozer he rented was working to prepare land in his garden in Tran Hoi commune, Tran Van Thoi district. He immediately reported what he found to local authorities. About two weeks ago, the local force also collected another napalm bomb weighing about 350 kg in the same commune. Over the recent past, Ca Mau locals have detected many explosives left by the war, especially in the district. A serious case was recorded when a shell exploded in late last year in the district, killing five.